We are proud to say that our farm’s buying club has started and we just added free delivery for Cape Coral and parts of Fort Myers!! Click here to see if you are in the delivery area. Rather than a traditional CSA (community supported agriculture), where people buy shares of the entire crop at the beginning of each season up front, we have opted to form a buying club instead since we will be growing all year and don’t want to burden anyone financially by requiring a full season’s payment up front. With our buying club, you will be able to enjoy better priced organic as well as aquaponic produce from our farm that is naturally grown, clean, chemical-free, and GMO-free produce. Rest assured, we will not sell any eggs or meats that have been treated with antibiotics or hormones. That’s part of our farm’s commitment and guarantee to you….clean, unadulterated food! There will be different options for harvest baskets of produce and they will change in content week to week as well as having periodic add-ons, like eggs, honey, cut flowers, organic and pastured meats and other specialty items that are local. The harvest basket options are suited for one-person to a large family. You can also add-on more items that we have available to any basket. There are no minimums and no maximums. Just buy what suits you. 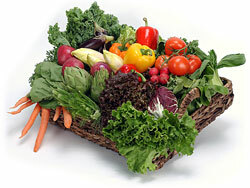 The harvest baskets may be picked up at the farm by appointment or one of the farmers markets we attend. Another option is the free delivery program we started..